Michael Beeman (Fiction, S’09) was excited to see his piece “Advice to Fictional Characters on the Occasion of My 31st Birthday” appear on Thought Catalog recently. Sheila Boneham (Creative Nonfiction/Cross Genre, S’13) is thrilled to announce the release of her second mystery, The Money Bird (Midnight Ink). The first book in this series, Drop Dead on Recall, was named one of the Top Ten Dog Books of 2012 by NBC Petside (in a field of mostly nonfiction) and has been nominated for best novel awards in this year’s contests sponsored by both the Dog Writers Association of America and the Cat Writers’ Association. Six of Sheila’s nonfiction books have been winners in those contests in the past. Julie Day‘s (Popular Fiction, S’12) story “Unmaking” was published in Weave Issue 09. The story was originally written as part of a flash-story challenge in one of Jim Kelly‘s workshops and grew from there. Jessica de Koninck (Poetry, W’11) has two poems in the anthology Of Sun and Sand. To download a free copy, go to the publisher’s website, click on “Bookstore,” and then on the link to the book. Adam Mills (Popular Fiction, W’12) has been nominated for a 2013 World Fantasy Award for his editorial work on the website Weird Fiction Review. He shares this nomination with his editors-in-chief Ann and Jeff VanderMeer. The 2013 WFAs will be distributed at this year’s World Fantasy Convention in Brighton, England. Adam has written an official statement about the nomination, which can be read at his personal blog. Bruce Pratt‘s (Fiction, ’04) short story “Saturday Night Lights” is included in this month’s Portland Magazine. On August 29th, he will be reading poetry as part of the Millay in Love poetry evening at The Whitehall Inn in Camden at 7:00 p.m. with Christian Barter, Kathleen Ellis, Carol Bachofner, and others. On Thursday, September 12th at 10:00 a.m., Bruce will join poet Kathleen Ellis on WERU radio for a live reading and discussion with Ellie O’Leary—89.9 in Blue Hill, 99.9 in greater Bangor, and on the web. Also, Bruce will be a teaching playwright at the second annual Ten Bucks Theatre 24-Hour Playwriting Festival in Eddington, ME, September 20-21. Details can be found here. “The Apple Tree,” a poem by Dana Robbins (Poetry, W’13), was a runner-up for the Fish Poetry Prize 2013 and is published in Fish Anthology 2013. Several excerpts from Lisa Romeo‘s (Creative Nonfiction, S’08) memoir manuscript have appeared recently: “Conversations I Can’t Talk About” was included in the Summer issue of Lunch Ticket, “Smoking Guns” was published in the August issue of Pithead Chapel, and “Old Men Who Write” is featured in the first online issue of Under the Sun. “Pranked” and “Teaching with Tolerance,” two essays by Julie L. Scharf (Creative Nonfiction, S’10), will be featured in the Autumn Equinox issue of Mused: The Bella Online Literary Review. Aaron Hamburger (Creative Nonfiction, Fiction, Popular Fiction) will teach creative writing at George Washington University this fall. 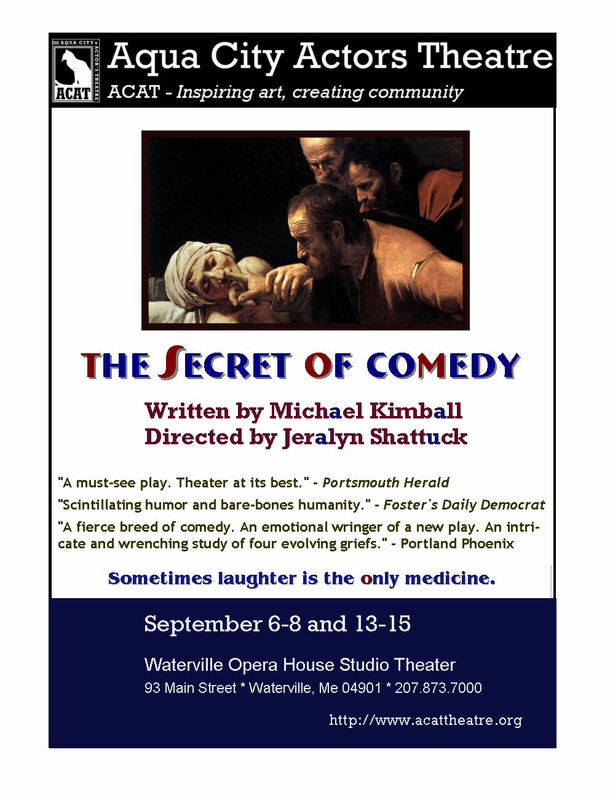 Mike Kimball‘s (Popular Fiction, Scriptwriting) play The Secret of Comedy will run for two weekends (September 6-8 and September 13-15) at the Waterville Opera House, 93 Main Street, Waterville, ME. Tickets and information: 207.873.7000. Also, Mike’s multi-award-winning short play Say No More! 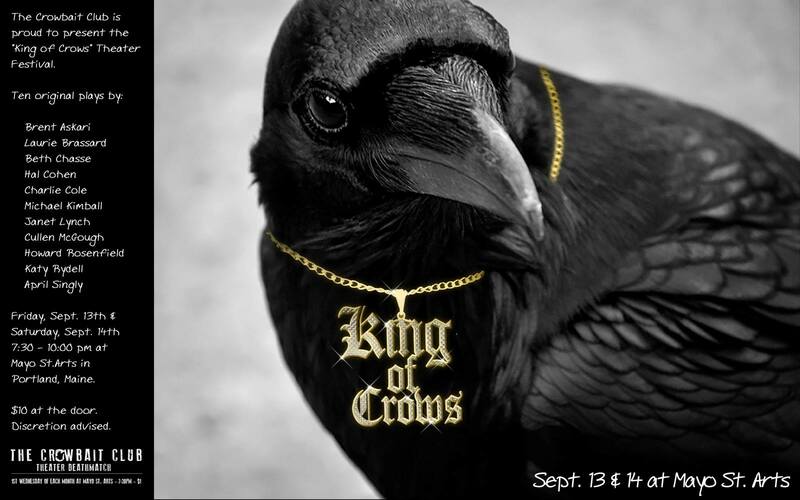 is one of eleven short plays—none more than 10 minutes long—comprising the “King of Crows” Short Play Festival: September 13-14 at Mayo Street Arts Center in Portland, ME, 7:30-10:00 p.m. $10 at the door. Elizabeth Searle (Fiction, Popular Fiction, Scriptwriting) won the Best Feature Screenplay, Romance prize for her script A Four-Sided Bed at the 22nd annual Woods Hole International Film Festival on Cape Cod; she was on hand to accept her award at the closing ceremony on August 3. 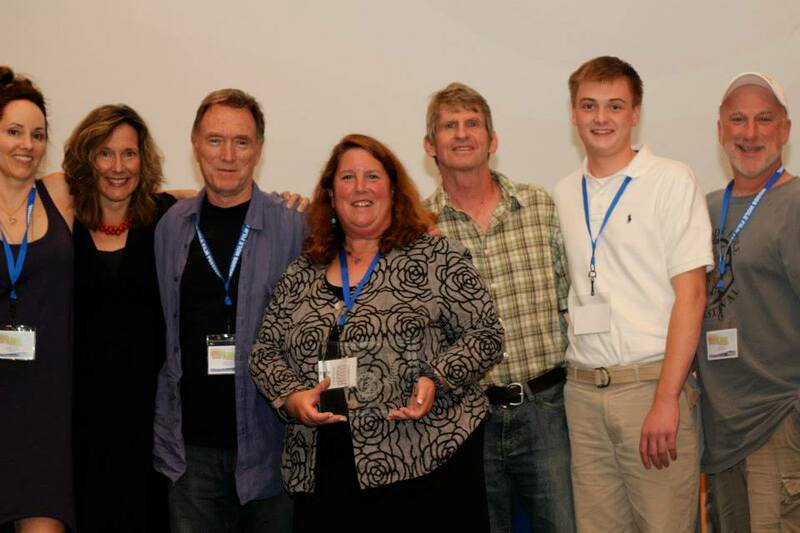 Elizabeth and other award winners at Woods Hole International Film Festival, with festival Director Judy Laster in the center. Via Catherine Schmitt (Creative Nonfiction, W’12): The Catch: Writings from Downeast Maine is now accepting submissions of poetry, fiction, and nonfiction. We are looking for work that can be “located” eastern Maine (by a street address, locator map, or latitude and longitude), but we will consider any work that is inspired by our fishing and coastal heritage. Visit the website for more information, to read the 2013 issue, or to submit.